The sun always shines with its comforting warmth, the beaches bask in its bright glow and the people are so tan they appear almost golden. This is Paros in the summer time. 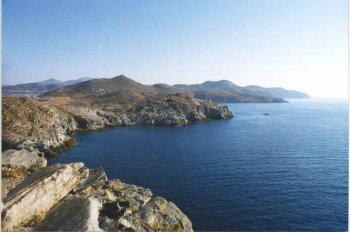 It is a beautiful moderate sized island located south of Athens among many of the other Greek islands. 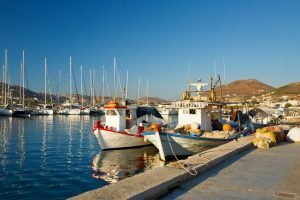 The nearest islands are Antiparos and Naxos. 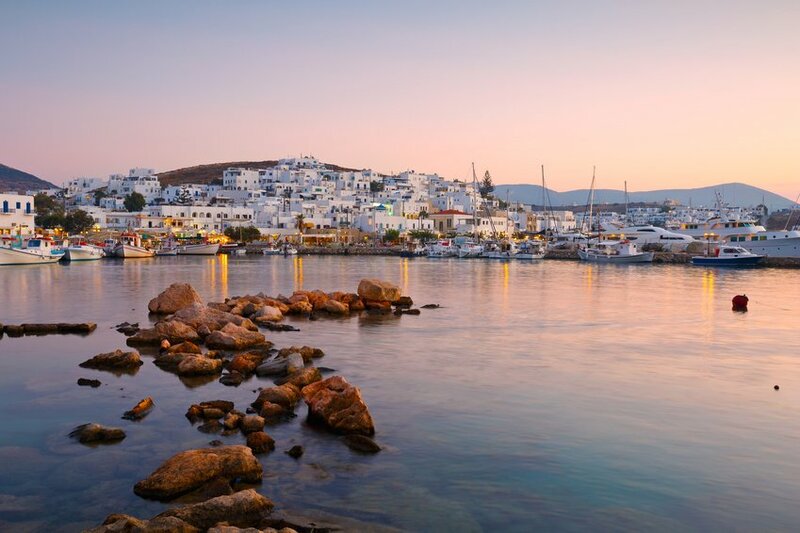 Paros (population about 10,000) is your quintessential Greek island, from the white washed walls with the blue tiled domes, to the barren upper portions of the island, to the crystal clear blue aquamarine waters. 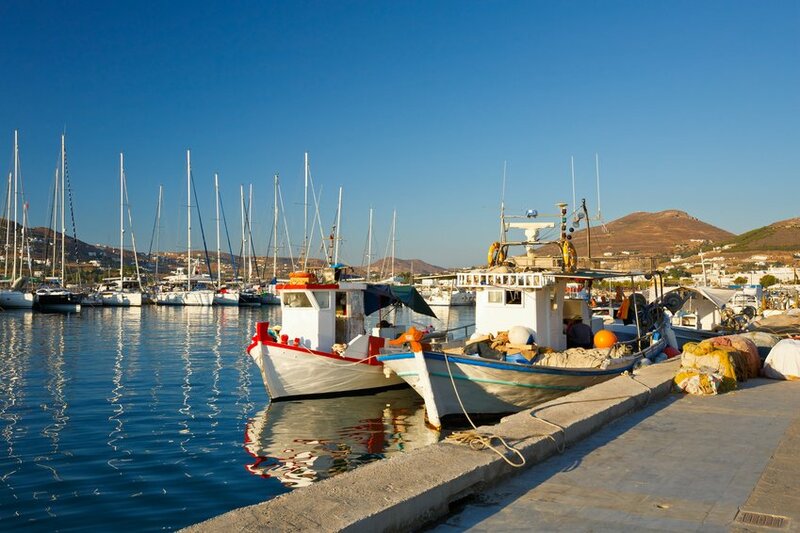 Paros is a vacation summer paradise. Parikia is the heart of the island and is the largest city. This is an excellent location for enjoying many various activities. People watching is a pastime of many of the tourists and locals along the harbor front. However, there are better times than others for this. The best times are midday when the ferries arrive and in the evening around sunset when the town becomes more active. Ferries and hydrofoils are a great way to get around between the Greek Islands. The ferries are a bit cheaper than the hydrofoils but also a bit slower. For his money, Dave takes the hydrofoils. We left the waterfront in Athens in the early morning during what photographers call the “golden hour”. We were on a heavily loaded ferry with many people and lots of cars in the hold. We promptly made a beeline for the top deck in order to be in the sun and breath in the fresh salty air of southern Greece. We spent an hour reading some of the tour books about the Greek Islands. Every so often we would glance up and make small conversation with fellow travelers. The water was crystal blue aquamarine. Out popped a small portable travel radio for some added enjoyment and we caught the end of an English newscast that said the Onassis clan was sailing in the southern waters of Greece. The Greek islands are a stark contrast to the blue surrounding oceans. They are often whitish and bare ground is abundant on the unsettled ones. Very few trees were present. When first arriving on Paros in Parikia by ferry you can see from several miles away crowds of people. They are swarming around the harbor area like ants on an ant hill. Soon they come into focus and you are able to see many of them holding up signs advertising lodging, restaurants, and transportation. As soon as you step off of the ferry you will be surrounded by enterprising young people. Chances are you will need lodging but you may not have any recommendations, and tens of “choices” are walking around with signs in their hands. We were able to secure extremely nice lodging for a very low price. We stayed away from the younger men carrying signs and those that looked a bit unkempt and went for the families or at least what seemed to be parents and children. If you are staying on the north west side of the island try to get lodging that is within walking distance of Parikia. We like to settle our lodging first, unpack, get mentally prepared for the normal challenges of a new town, and then venture out. If you are willing to try a motor scooter, they are an excellent means of getting around the island. I highly recommend renting one. I rented a nice motor scooter for a week. I think I paid around $12 US per day which is very very reasonable. They don’t take much gas, very little oil and are all you need for getting around the island. They are ideal for zipping in and out of traffic in Parikia especially around the extremely busy time when the ferries arrive. They allow you to bypass the terrible traffic jams that form around the harbor front. Fortunately these traffic jams don’t last for more than 20 or 30 minutes and then voila the streets are completely empty again! Note: these scooters handle quite differently on the dirt than on the paved roads. They don’t respond quite as easily and it is much easier to spin out or fall over especially when cornering. It takes about an hour and 15 minutes to traverse the entire island by a motor scooter. This is if you are doing between 50 and 55 mph most of the way and you do not stop anywhere. Two outlets that I recommend for renting motorcycles, dirt bikes (there are a lot of excellent off roading opportunities for those off road enthusiasts), and scooters are Parai Rent-a-Car-Motorcycle at Phone: 21 1771. They can be found along the waterfront towards the south of town. Paros Rent-a-Car is found north of town and can be reached at Phone: 24 408. The mopeds allowed me to explore all parts of the island. I was able to access parts of the islands that very few tourists every get to. They were ideal for getting to isolated beaches, tops of mountains, and were good on paved and dirt roads. There were some good off roading across from Parikia on the Cape Agios Fokas.